History: SALGA-NYC, Serving the Queer Desi Community is committed to combating all forms of oppression and discrimination. The all-volunteer non-profit organization promotes “awareness, tolerance, acceptance, empowerment and safe spaces for sexual minorities and people of all gender identities, who trace their heritage to South Asia or who identify as South Asian.” Its programming includes monthly support group meetings (open to people who identify as both queer and South Asian), workshops, a weekly hotline (supported by Asian & Pacific Islander Coalition on HIV/AIDS, The Stonewall Foundation, and Trikone, San Francisco), and political, cultural, and social events that are open to the general public. The recognitions that the organization has received include the 1995 Community Service Award from the National Gay and Lesbian Task Force. The organization was founded in 1989 by twelve South Asians, including Javid Syed and Gayatri Gopinath, and originally named the South Asian Gay Association. In 1991, as women began to join the organization in increasing numbers, the South Asian Gay Association (SAGA) was renamed the South Asian Lesbian and Gay Association (SALGA). To recognize the experience of South Asians of all gender identities, the organization renamed itself once again in 2010 as SALGA-NYC, Serving the Queer Desi Community.Some of the organization’s current and past events include Devi Diwali (an annual Diwali celebration), Jungli Boogie (a film party), and the Women’s Salon (held for the first time in 2008). SALGA-NYC events have featured DJ Rekha, DJ Tikka Masala, DJ Gita, and DJ Brown Sugar. The organization marches in the Gay Pride Parade every year. In 1993, SALGA-NYC’s application to march in the India Day Parade, organized by the Federation of Indian Associations (FIA) every August to mark India’s independence, was rejected. SALGA-NYC continued to submit annual applications to march in the parade and was repeatedly barred from participating. The FIA provided various reasons for their exclusion that appeared inconsistent and discriminatory. To address the rejection of their applications, SALGA-NYC formed the South Asian Progressive Task Force with other South Asian organizations in 1997. In addition, SALGA-NYC organized protest marches alongside the India Day parade’s Madison Avenue-route, often joined with SAKHI for South Asian Women. 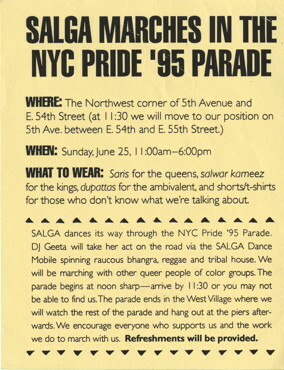 In 2000, SALGA-NYC was allowed to march in the India Day Parade only to be denied the right in 2009. To counteract this discrimination SALGA-NYC mounted a protest that constituted marching silently on the sidewalk alongside of the parade, garnering much media attention. In 2010, only hours before the India Day Parade commenced, SALGA-NYC was granted permission to march once again. Sources: SALGA-NYC. “About Us.” Accessed February 4, 2015. http://salganyc.org/about-us/. Stolberg, Sheryl Gay, and Robert Pear. “Wary Centrists Posing Challenge in Health Care Vote.” New York Times, February 27, 2010. Accessed February 4, 2015. http://www.nytimes.com/2010/02/28/us/politics/28health.html. Lee, Denny. “New Tolerance at an Old Tradition.” New York Times, July 30, 2000. Accessed February 4, 2015. http://query.nytimes.com/gst/fullpage.html?res=950DE4D6173DF933A05754C0A…. Millner, Denene. “Gays May Protest India Day Parade.” Daily News, August 17, 1995. Accessed February 4, 2015. http://bit.ly/1DGtJAq. Mohin, Andrea. “South Asian Gay and Lesbian Group Marches for India.” New York Times, August 22, 1994. Accessed February 4, 2015. http://query.nytimes.com/gst/fullpage.html?res=980DE4DF1539F931A1575BC0A…. Sen, Aneesa. Conversation with the author. New York, NY, August 13, 2010. Sengupta, Somini. “Gay South Asians Sidelined at Parades.” New York Times, August 4, 1996. Accessed February 4, 2015. http://select.nytimes.com/gst/abstract.html?res=F10617FF385B0C778CDDA108…. Summary: SALGA-NYC’s records total 0.75 linear feet and contain correspondence (notes, letters, and emails), publications (newsletters, bulletins, magazines, and newspapers), meeting agendas, flyers, media clippings, and other paper ephemera organized thematically in folders. Of particular interest is the documentation of SALGA-NYC’s efforts to be included in the Federation of India Associations’ (FIA) annual India Day Parade. These files contain email and letter correspondence with the FIA from the years 1995 to 2001; notes on proposed actions including demonstrations and alternative independence day events; emails and agendas regarding the South Asian Progressive Task Force meetings; letters from SALGA-NYC to the editors of the New York Times, Village Voice, India Abroad and to other organizations including SAKHI for South Asian Women, South Asian AIDS Action (SAAA), and CAAAV Organizing Asian Communities. Also of note are letters from SALGA-NYC addressed to the Prime Minister of India. Written in 1994, the letters call for a repeal of Section 377 of the India Penal Code. Publications contained in the records include multiple copies of SALGA-NYC’s newsletters and bulletins (1995-2000), issues of Trikone magazine, scholarly articles, and issues of the New York Times which feature articles of relevance to the queer South Asian community. Media clippings, spanning the years 1995-2000, of SALGA-NYC’s event listings from publications including TimeOut NY and HX Magazine as well as multiple copies of event flyers are contained in the organization’s event folders. Other files include SALGA-NYC’s financial and administrative records, which consist of vendor contractors, revenue summaries, and copies of receipts and bills from SALGA-NYC’s public events. SALGA-NYC’s also maintains two zip drive disks on which digital graphics files including images for publicity materials are stored.